Book a flight in just a few easy steps Check in, change or cancel your domestic flights. You can also book and check in when you fly with us to any of our international destinations. Plus, add extras like EarlyBird Check-In®. Super-Fast Shopping & Booking Book a trip in just a few quick taps. Use Face ID® to make booking even faster! You can also store your credit cards or use your PayPal® account to purchase. 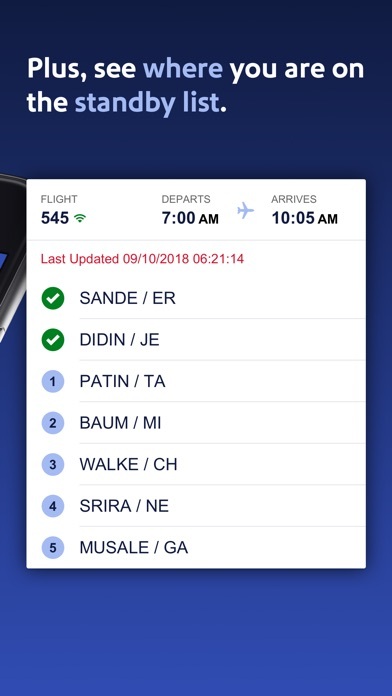 Everything you need to Travel Get the information you need right at your fingertips on the home screen - gate information, boarding position, flight status and more. Boarding Pass on the Go Get your own boarding pass 24 hours in advance and save it to Apple Wallet™. *To obtain your own boarding pass on a multi-passenger reservation, you must be logged-in and have your Rapid Rewards® number associated with your trip. Inflight Entertainment Use the app to take you to our Inflight Entertainment Portal where you can watch Free Live TV1*, listen to Free Music1*, play Free Games, access on-demand TV content2*, and watch Movies without having to download a separate app2* *Available only on WiFi-enabled aircraft. Limited time offer. Where available. 1 Due to licensing restrictions, on WiFi-enabled international flights Free Live TV and iHeartRadio may not be available for the full duration of flight. 2 To view movies and select on-demand TV content, download the Southwest app from the App Store before your flight. Airport Pickup and Drop-off Thanks to our partnership with Lyft®, you can now use the app to help you request a Lyft®! You’ll know key information like estimated time of arrival and estimated price before booking. More of a rental car person? You can do that in the app, too. Cars, Hotels, and Vacations Use our app to quickly book all of your travel needs. Earn Rewards when you Travel Sign up for Rapid Rewards® and earn points on your flights. Did you forget to add your Rapid Rewards number during booking? – No worries, add it after booking your flight and earn points. You can then use those points to purchase more flights! Appreciate everything about Southwest Airline! We are grateful for no fees on 2 checked bags and no fees charged when making changes in flight plans! Thank you SWA! This was an easy app to use. It just took a couple minutes to find and book a trip. Very nice!! While I realize the convenience of having assigned seats, the customer service is phenomenal as are the flight crew. Well worth the trade off. Unable to view boarding pass on my phone. The nickname is ridiculous! I thought you could only check in a least 12 hours before your flight. Did that change. I try to follow the rules and I end up with a C group boarding group. Great apps and customer service! Your apps is week for simple things like just checking in and getting boarding pass. It’s easier to just go to the southwest web site. So well designed! Another reason I love to fly SWA. Great prices, two bags free I can take my snowboard with me free southwest rocks!!!! I will never pay for early checkin. B 40 is not worth $20. Never again. My wife did not pay for early checkin and is A 32. Screwed for the last time. Southwest has the most personable flight attendants. On every flight I have taken there have been humorous announcements. As a former employee of TWA, I miss the way flighting was. At least SW seems to have the employees who most enjoy their jobs which helps a lot! 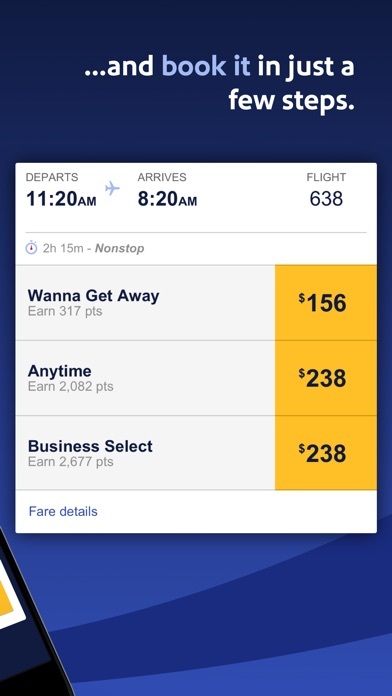 This app makes booking flights, checking into flights a breeze. Most every time I fly the flight arrives to my destination early! Thank you! i ❤️ south west ! I like the way app works! Always enjoy flying SWA. I have had a few bad experiences, but such is life. My 2nd leg flight back to Dallas was cancelled due to weather. I wanted to desperately book a another flight back, but it said I had to call. I have been on the phone w/ SW for the past 30min, and I am slowly watching flights get sold out, and I cannot change my flight on the app. VERY FRUSTRATING!!!!! As a Rapid Rewards member, SW should have called me to proactively put me on another flight!!!! NOT good customer service!! If Southwest doesn’t doesn’t go there neither do I. Saying “Always Reliable” these days is hard. Business staff’s customer attitude can vary with the weather. I fly very early in the day, and every Southwest person has ALWAYS been kind, respectful and helpful to me. Hats off to y’all! Staff compassion, consistency and in-flight messaging and movies is easy and awesome. Your app makes planning my travel so easy and quick! Have been using for the past three years and loving it! Called yesterday to get answers to some basic questions. The person who spoke with me was very professional. He ensured that I had all my questions answered. I appreciate the quality service Southwest gives me! 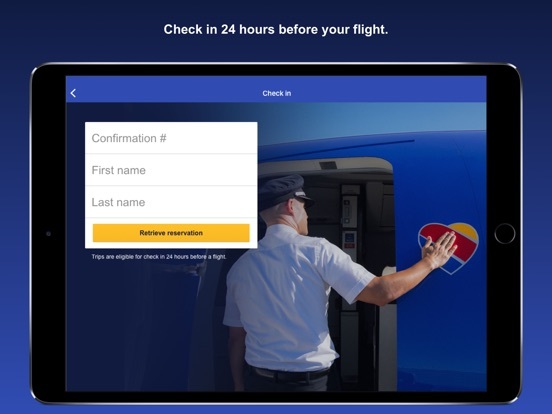 From the app to the customer service... Southwest makes it easy!! Thank you! I love this airline, the service and price are awesome! The only airline that slows passengers to bring free bags. Thank you! Please keep the good services!!! Thank you Southwest Airlines! You make traveling to our favorite places so easy! Application needs some work. The early bird check in does not work(extra cost). I checked in on time and got B31 multiple times. Where is A16-B30? Why do I have the enter a name? Love the app, the service, the prices, the consistency. If all kept I’m here for it! Whenever I travel I always go SW unless they don’t fly to my destination. I always get the best deals only thing I don’t care for is the “No seat assignments, as I have had a few trips where I was able to sit with My Fiance. But the service and airfare prices make it all better for me.. Great Job South West.. Way to go!!!! When will Southwest let people with legal hyphenated names use their real names? It doesn’t even match my I.D., to get a ticket which changes my last name! Love the included baggage and often better prices than others, but do wish SW would fix this!!! The most confusing app I have ever used. Very difficult to change flights to another airport. Love Southwest Airlines and all your employees except the ones you had to take in on your purchase of your northern airlines up by Baltimore. Pleasant professional staff, very helpful getting to my destination. 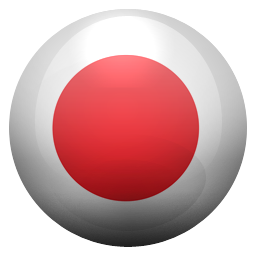 Very good apps it easy to use. The online check in is terrible. When clock turns to the time you get an error message multiple times. Very frustrating. After using so many web sites for the airlines this is by far the best and the easiest to use. 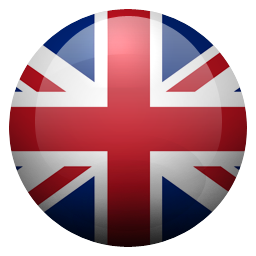 Quick easy App to use. A check in notification is huge! I would like to be able to have my boarding pass AND my children’s passes, but the app doesn’t allow that. The check in process is a bit clunky. I would like the ability to link different confirmation #s so I can pull multiple travelers at one time. SWA is always easy to book online and if I ever have to contact customer service I’m always satisfied in the end. Best airline! When trying to check in it is difficult to memorize your confirmation number, or have to write it down . It would be nice if you didn’t have to type it in it when you hit check in on your app it was already loaded. When using my phone with app it should already generate confirmation number. Paid for early bird check in but it didn’t work. Not happy. Start app. Wait 30 seconds. App tells you are offline. Click “OK”. App starts. Click on hamburger menu. Watch as nothing happens. Click on profile. Click on “Past Flight”. Watch airplane chase it’s tail. Die. Paid for early checkin to be on boarding group A but it did not automatically check me in so now stuck on group b and had to do it myself! Ugh! I love the airline and the flight booking and status is easy and quick ! Great service and always fly to almost all the destinations I fly to. SW has a very efficient system of reservation , booking and cancellation . Why does it not checkin the reservation you are looking at! I forgot to set a reminder to check-in to my flight. The app sent me a notification to remind me! Southwest Is The South Best. Been using SWA app and makes everything so convenient from booking flights, checking in for boarding. I love it. Doesn't store flight once checked in??? You have to keep looking up your confirmation info Everytime you want to view your boarding pass. 2019 SW! Figure it out! I checked in and got my boarding position, but the app does not show me or tell me how to get the UPC for scanning. It tells me to go to a kiosk and print boarding passes. Why have the app if I have to print boarding passes? I am a frequent flyer. None of the other carriers make it as easy as SWA’s check in process. It’s fun to fly SWA. You aren’t able to download everyone’s boarding pass on your app if there are multiple people flying with you. Really annoying, especially since other airlines have figured this out on their app. Where is the iPad app!!!? Would love an iPad app! Couldn’t pay for early bird seating due to error on App stating pricing didn’t match. So called and left message for customer service to call me back. Agent called after 25 mins and she sounded like I was an inconvenience in her day. I explained their site wasn’t working and I advised her I wanted to pay for the early seating which stated was $45. She said it was $50, I asked her if she could provide this for the app prices and she replied NO do you want to book your seats online? I thanked her for her lack of service and hung up! Worst service I’ve ever had and hope it’s not a trend moving forward! Check in does not work. Been flying back between Baltimore and Tampa using southwest for many years now. 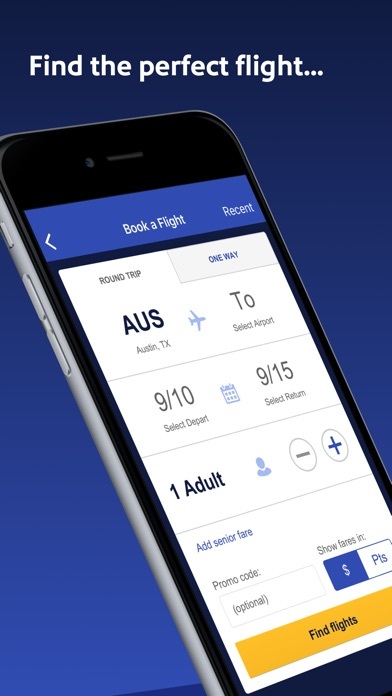 This app makes purchasing tickets, checking in & accessing your boarding pass as easy as 123. Very efficient. However, wouldn’t it be nice if you could use the app to assist you with locating a lost item during your trip. As it pertains to the airline or the airport. As a back-up for complete failure via customer service phone call attempts. During my most recent trip I left my winter coat w/ my cell phone in the pocket at the southwest gate B3 in the BWI airport sitting on a chair right by gate line up. Reported it to both BWI lost & found as well as southwest customer service. Let’s just say: clueless, ineffective, disorganized, inaccessible & passing the buck would best describe my experience thus far with both the system in place for resolving this scenario or speaking to someone about it. I can’t blame the app here, the captain flying or the crew on board who consistently succeed at their job. However, I’m not happy with southwest & BWI’s teamwork in leaving me out in the cold (pun intended) on my way back up north tomorrow with a winter coat after a week of trying to just get a valid & directed response. There’s gotta be a better way! Why not incorporate the app. somehow? 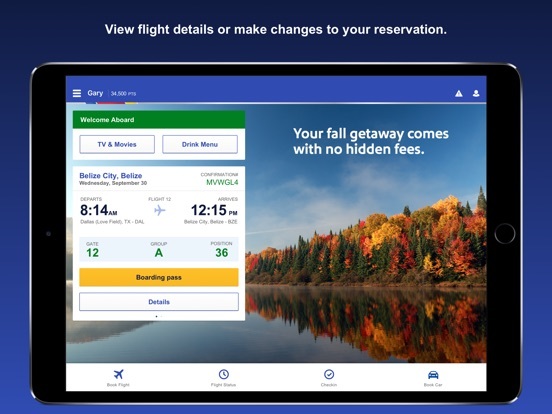 Love this app and Southwest. I try to only fly Southwest when flying home. It’s a direct flight and the app makes booking, checking in and obtaining the boarding pass efficient and convenient. I appreciated it even more when my mother was ill and I flew home for the battery of tests needed for her. I booked a last minute flight for Christmas Eve. Most flights were atrociously expensive but my Southwest flight was $75!!! I couldn’t book it fast enough. My mother was diagnosed with stage 4 cancer so my return flight was pushed back. I easily changed flights through the app within crazy fees. This occurred a few times as my mother quickly succumbed to the disease and I had to postpone my return flight again. I cannot express how unbelievably thankful I am that during such a fluid, emotional and challenging time that my travel was so easily changed through the app at any time - and that I did NOT incur RIDICULOUS fees (my friend recently paid $250 to change flights to a less expensive flight through another airline???) that would’ve compounded my anguish at such a time. I already loved Southwest but I’m this day and age, I appreciate them even more. I totally appreciate the LOVE! Every time I fly this airline I walk into an atmosphere where the employees have the freedom to be funny, to bring more of themselves into their jobs (on my last flight between Philly and Denver the flight attendant sang- she was awesome! ), and where they seem to genuinely enjoy coming to work and also working together as a team. That happiness is contagious and only makes me want to add my own energy to it. (“What the world needs now is love, sweet love...”) I fly often, and as often as possible with Southwest. Pulling up to the airport, my own smile begins as I get out of the car and head to curb side checking; I know that from this first moment of my “Fly Southwest” experience, I will encounter energized, proactive, and friendly people who do a great job. And I know that the experience will simply continue through the moment I touch down at my final destination. I also TOTALLY appreciate the lack of baggage fees and the no-hassle trip change policies. Such a relief, and such an example of a better way to work with and treat people. We are all one human family and life is hard enough. Southwest makes it better! I was disappointed with booking a flight. I am planning a trip to Chicago, and there was an option to sign up for a credit card and receive $200 dollars credit on the flight that I was booking. So I applied and qualified for the chase credit card. I went through the entire booking process and when I got to the last step there was an error that said that the phone number I entered was in the incorrect format. I tried like 20 times, and know that I put the phone number in correctly, there’s no other way to put it in. I kept getting the error and eventually the offer had expired 15 minutes later. I am very frustrated that this happened. The next morning I called SWA, and the representative told me that there was nothing they could do about it. She told me that I could call chase and try to figure it out with them. After I called chase, the representative told me that I would have to call SWA and they could help me figure it out. Sadly there was no resolution. I applied for the credit card to gain some points on future flights and I can’t even use the incentive that they promoted on the bottom of the screen. My credit card doesn’t even arrive until a month after I get back from my trip. Please fix this problem so another person doesn’t get as upset as I am right now. Recently we purchased tickets to flight to California for a family trip. We had one reservation but 5 travelers total. When we tried to check in outside the 24hr window, the app gave some odd error message stating that this reservation was not eligible for check in, which is not true... we were outside the check in window, but we were eligible for check in. Once inside the window we were able to check in, but we were not able to download the mobile boarding passes. Instead we were directed on the app to go to kiosk and print them. In doing web search on SWAs website about multiple boarding passes with one reservation it apparently is doable, but when I called customer service to inquire they state that it’s not doable...so which is it? 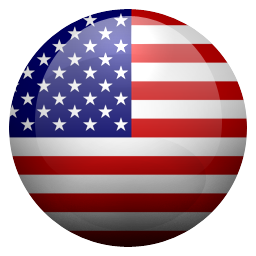 We recently flew with American Airlines and I was able to do this with their app. We simply checked in, downloaded the boarding passes and airdropped them to my family. Since SWA prides itself on its innovative and progressive approaches, I wonder why they can’t get with the times and fix this seemingly simple issue. As a long time customer, and someone with a large family, traveling can be a hassle, so if SWA can make our lives easier by fixing this we ALL would be much appreciative!! The app is great if you’re booking your standard one way or roundtrip fares. It would be nice if you could book multiple destinations and legs of a trip within one booking in the app the way you can on the website. Also, it would be great if you could purchase inflight wifi from the app since our credit card and info is already attached there. Currently, you go through the website and browser. Also, if southwest could figure out a sign-in situation for the wifi to use on more than one device you own, that would be great. I had to pay $8 twice because I purchased the wifi on my phone first and then realized I needed to get work done on my laptop but could not use the same connection on more than one device. I believe Delta has figured it out, but it would be a great enhancement so I’m not double-paying or have to change my phone plan to use that as a hotspot for my laptop. If we’ve paid for wifi, it’s fair to be able to use it on multiple devices you own through some sign-on feature. The customer service was very rude. I have been on a plane over 10 times and Ive always had great friendly/funny Pilots, flight attendants, anybody working on the plane that Ive encountered customer service with. And to me thats one of the most important things. They were EXTREMELY rude while I started to feel sick on the plane which has never happened to me before I always have great flights with no problems, but usually I fly through Delta. I will NEVER fly with Southwest again because of how rude the workers were to not even just me. They were also super slow on getting our drinks out and no snacks were offered, which I thought all airlines offered snacks. And when I was using the bathroom I had forgotten to lock the door, one of the ladys working knocks and then OPENS the door to tell me I need to lock it. Luckily I wasn’t in the middle of going to the bathroom I was just about to wash my hands...I didnt notice if maybe the door was slightly open and she saw that I wasnt going to the bathroom so she opened it..but either way I thought it was rude of her to just open the bathroom door knowing I was in there. I didnt happen to catch the girls name that I had bad experiences with but she had short blonde hair, slightly bigger. I have had fairly good luck w/ this app, however this review will highlight the reason NOT to pay for the Earlybird Check-in (36 hours before the 24 hours check-in). It cost $15 and you would think that you get a preferred boarding position in line. I was unable to do this on the app, even though it has a place to put your information and credit card data in, but no place to submit after all of your personal information has been entered. I finally called the Southwest rep and she completed the transaction via her terminal, (well within the 36 hours requested) however, she was unable to tell me my boarding letter and number. I would need to check-in during the regular 24-hour booking. When I received my booking I was shocked to find I was a B-13 and a friend who was traveling with me and chose not to pay, was a B-2.!! I called the SW rep and was given a feeble reason “that they just log in and give you a boarding number that is available at the time. They do not check to see if other passengers have a number higher than yours.” WHAT!!? Then what is the reason passengers PAY for a FAKE 36-hour boarding pass. Learn from my mistake and DO NOT PAY for an inflated fee that does not get you preferred boarding. Shame on you Southwest! I received a Southwest 100 voucher from Southwest after spending several hours delayed in the airport. I was pleasantly surprised until a attempted to use it but needed to cancel due to family emergency. What they FAILED to tell me is the voucher number changed to the flight I cancelled thus when I attempted to use it utilizing the voucher number it wouldn’t let me. I attempted to call southwest but this was during the hurricane emergency and several of their customer service locations were not available. I certainly understood that so I went ahead and scheduled my flight WITHOUT the voucher credit. Finally I got ahold of someone who said they could extend for another year because of my trouble and they could see where I had flown again with the voucher but they encouraged me to wait a couple of more months to call and extend since they could only do it once. I did so but the person I got said no. I explained to numerous phone calls and what I had been told but again was said no and no dialogue had been entered into my record. Be careful with your voucher IF you receive one. Southwest does not have the customer service it use to have. My job requires that do a lot of traveling, the majority by air. Southwest makes flying easy for me. The Mobile App is quick and easy to use. If I need to change a flight, that is so easy and I really appreciate no change fee! I don’t have that with other airlines! The No Baggage Fee is the reason I started with SW, but the convenience of flying with them has kept me as a customer. I love the no hassle boarding and open seating policy. If they flew more routes to the Northeast, I would never fly any other airline. But the real reason I am a true SW Flier is their employees. Whether it’s the Sky Cap, the Counter Agents, the Flight Attendants, or the lady in the Lost Baggage Office (yes, it does happen) I have found all SW employees to go above and beyond what I experience on other airlines. They seem to really enjoy their job. And for the pilots (of which I’m a member of the club and tend to grade landings) you are the best! Keep doing what you are doing and I’m a Southwest customer for life! With string enough internet, updates are timely and booking is a clear process; the app has never failed me! But there are two things that would make it more convenient. 1. A Check In button below the next upcoming flight. If my confirmation number and travel information is in Trips, why do I still have to go to Check In and enter my confirmation and name? As someone who tries to wake up 24 hours before my flight in a panic to check in, this would be really nice. Unless they’re doing this on purpose. 2. I’d like to be able to keep travel funds in a place attached to my account then deduct from them when I book instead of constantly having to enter them as a payment option. I can save credit card info so why not travel funds? Simple shopping platforms apply credit saved to purchases and note the difference of values. This should be for browser and app options. I can also see this inconvenience as purposeful if they want folks to forget they have travel funds. You can’t look up or book international flights using the app; you need to use the desktop site. It is annoying that you can’t switch between dollars and points while looking up flights; you need to start a new search if you want to view dollars instead of points and vice versa, even when it’s the same flight search. Southwest, can you please have your webmaster add that feature? Thank you! Also, we should be able to revise our travel companions and make account changes using the app (and website) instead of having to call. Southwest is always my first choice when flying! I use the app when possible but find it necessary to use the desktop site or call when the app doesn’t facilitate, and why provide an app for your customers if it is less convenient and not equal to what you can accomplish on the desktop site? I know these are first-world problems, but I’m just sayin. I love Southwest. Amazing customer service, great policies, and they get me where I need to be (with very reasonable prices). Yay! What is wrong with your app? Are you aware that when you try to book a flight whether it is round-trip or one way, is soon as you put in the date, There is no area to click “done “for the flights to come up on those days. Instead the only option you have is to hit the back button which takes you right back to the current day You are in and then you have to search for the flights and scroll forward through all the dates to get to the ones you are specifically looking for. It is the most frustrating thing using this app. How come all other airlines have it correct with the done button after you plug in your dates. Nobody should have to scroll all the way through ahead to find their dates because your app let you click on future dates that you’re looking for tickets, but then doesn’t upload with those dates. Can you fix this fast? Doesn’t provide important info. Terrible UX. If I’m logged in and click on flight status, I still need to type in a flight # or search by departing airport, etc. How about defaulting to showing me MY next flight? Isn’t there a pretty good chance that would be the info most people are after? I used the app to check into my flight and still had to get a boarding pass printed at the counter. And after checking in on the app if I wanted to view details of my flight A) had to enter the confirmation # again (which required me to go to my email to copy and back to the app to paste) and my first and last name (again, I’m LOGGED IN) at which point I have to “check in” again. And B) it shows my departure time for the first and second flight but no details on where my layover is and for how long (unless I do the math—adding the duration of flight 1 to the departure time and account for time zones except I can’t see where the layover is to know what time zone). Is it possible there is something broken? There can’t be this many people who fly and love Southwest if they are using this worthless app. It’s a seriously frustrating experience. Never have issues logging in and using this is a breeze! It’s not slow like a lot of apps with constant buffering etc and I love how fast it connects and every change made doesn’t slow it down. I and love how it keeps all my flight info conveniently located in a press of one button! I can see my upcoming trips and any future ones I’ve booked. All my trips I’ve easily booked on this app since I’ve had it.... going on a couple years. The convince of changing or canceling flights is as easy as booking! Also tells you how many rewards points you have and the option to use it or not when booking. The only down fall is I cannot yet book international flights and I can’t have access to any refunds owed to me by changing flights when I should be able to see what dollar amount I can use when re booking my next flight! All in all it’s my favorite app to use next to Hotwire! On Friday, March 23, 2018, customer service rep #40 (Josh) in Oklahoma City was absolutely amazing & a tremendous blessing to our family. A family member has terminal cancer & is required to travel to Houston M D Anderson hospital on a regular basis. The hospital changed the schedule in March on short notice. The fare change cost was $600 & my family could not afford it. Our family member was in great distress when the customer service rep they spoke with was of NO help, they thought they would have to drive or miss an important appointment ( they are in no condition to drive the 9 hour trip). I called after learning of the situation & Josh saved the day! The stress of the disease is more than enough to handle, the financial burden it brings can destroy the last thread of hope. I want to commend Josh for understanding the situation & assisting us in removing both mental & financial stress. The 1st was unkind & uncaring. It’s people like Josh that keep us loyal Southwest customers! From my business trips as a paralegal in the 1990s and 2000s to my retirement fun trips 2005 to now, Southwest is my only airline choice. NEVER a lost bag, NEVER a rude or incompetent Southwest employee. The open seating concept seems flawlessly smooth and efficient. Planes fly on time, and when there is a delay, such as 3 hr of being snowed in during a blizzard in El Paso on a Houston to Albuquerque flight AFTER airport concessions closed at 9:00 pm or so; Southwest employees kept us amused with games and prizes - I won a leather SW paperweight - and brought us water and snacks while regularly updating the storm’s status. Luckily the weather briefly cleared for takeoff and we headed toward ABQ, but knowing that airport also may close down and we might land in Vegas. We made it safely to ABQ just before they closed the airport for weather. Southwest CARES about the safety and comfort of their passengers. That’s why Southwest is MY airline! Nancy L Turner, Rockport, TX. I am beyond disappointed. I called day before yesterday to change my flight because I was concerned about the weather. I specifically asked the customer service representative if my early bird would transfer. She kept me on hold for 10 minutes then told me that she had to do some investigating and it did transfer. Even sent me a second email showing me it transferred. When I checked in this morning to my surprise I did not get early bird. So I call and the next customer service rep I talked to gave me the run around and basically the first customer service rep had lied to me!! So after paying an additional $126 to change my flight I now how no eRly bird that I paid for and was told did transfer. Then I was told to call another customer service number to address this issue and I was on the phone waiting for someone for 30 minutes!!! If I had known Southwest was going to be so cavalier about taking care of their customers after the money has been spent I would have never given them my business. Just a suggestion, pay the extra for a more professional airline. It’s worth it!! Everything about the flight attendants, the pilots, the airport, call center, gate agents, runway and luggage handlers (even in the cold, wind, rain, snow or some places the heat and sun too. You are such a customer oriented and friendly company that when you have an issue (and I mean I made a mistake which I totally own but you didn’t make me :-))you get to talk to a super friendly and helpful PERSON when you call. So win win and win You have overly earned an also continue to impress a current companion pass and A list member. For this and the many many other times you go above and beyond not because I think you have to, not because how I perceive what people think, but because I get the FEELING and see from the luv you give how much you care. Thank you to everyone behind the scenes and in front, without each other it’s just a broken heart and where’s the Luv in that? When I am logged in and looking at an upcoming flight, it is not clear whether I am checked-in or not. If a person in the traveling party is not checked in, there should be an option to check in next to the flight and person displayed. If a person is checked in, there should be an option to view the boarding pass. I am a parent traveling with my 4-year old, I bought the tickets but I cannot view and save my child’s boarding pass unless I sign out of my account and sign in with hers, and have to create an account for my child if she doesn’t have one already. That is not a good user experience and has no security advantage. If an adult buys tickets for him/herself and others on the same flight, especially minors, and even more so young children, the buying adult should be able to see and save the boarding passes for all the people traveling with him/her whom he/she bought tickets for. The app needs much more user friendly attention. It needs to address Lost Luggage, Missing luggage items, WiFi, & traveler’s flight opinions. If a traveler loss luggage or items missing from there luggage there should be a short cut(icon) to help you address this issue(s). WiFi should be added to app. Some travelers did not know that they should have downloaded a separate app before boarding. Not all airline use the same WiFi systems, this would save travelers time. Giving Southwest Air Line travelers a voice is empowering! The app should have a spot for everyone’s opinions. This would be the most useful system for Southwest learn exactly what needs to be addressed. 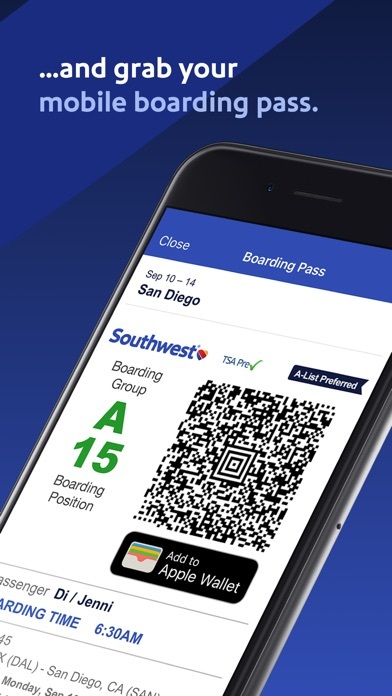 The Rapid Rewards number should be woven into the app to help users & Southwest Air Lines reduce the users form information entering. Seating Up grades should also have an icon. If seating upgrade is not possible on the app, it should address you to see or call a Southwest Representative. In all this would reduce Southwest Air Lines work load and save travelers standing in line. Recently traveled to Las Vegas and has an awesome experience to and from. I am obese and always sorry someone will complain who may sit next to me. During my departure I had this wonderful man from the airlines come up and asked me very discreetly if I’d be more comfortable with 2 seats. I responded it be nice but I can’t afford another seat. He told me he would take care of it. He brought me my boarding pass and an extra one to put in empty seat next to me. I sincerely thanked him. They allowed me to pre board as I am older and slower. When I returned I was automatically given same treatment. I hear horror stories about how some obese ppl are treated on airlines. In my opinion Southwest treated me with the upmost compassion and dignity from that first gentleman I encountered to the flight attendants. I’ll always fly Southwest. Bless Southwest and their employees for doing the right thing. 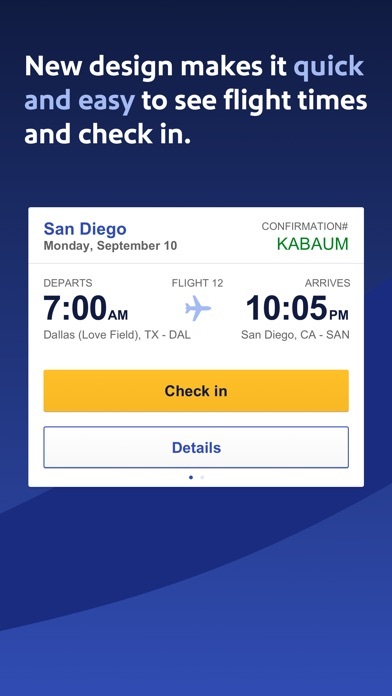 I am a loyal southwest customer, and I have been using this app for at least a few years now and I love it! But i keep having an issue that makes me go to the website instead of using the app for purchases. When I try to book a flight and choose the dates, it takes me to the calendar view to choose the dates but then there’s no way to get out of it! I pick the dates and then it just stays there, there’s no “back” or “finish” button, so I have to exit the app and can’t use it to finish booking or even check prices. In the past, once the dates were picked it would automatically go back to the previous booking page I think. Hopefully this is just a glitch but it’s been an issue for about a year. Am I missing something? As of now I book all my flights online and only use the app for the flight info and boarding pass. I would like to be able to check flights and prices too. My wife and I booked the same flights between Boston and Nashville for weekend of Mar 29-31. I received a message 1-2 weeks ago that I could reschedule it for free. I assumed it was due to Boeing issues. But when I looked on my app to reschedule, my flight was still available and my wife did not receive a notice. So I kept the flight. This morning, 5 days before the flight, my wife received a text message that the flight was cancelled. I did not receive this message. We looked on our app and saw our flight is no longer shown. So we both rescheduled from our non-stop flight to a later 1-stop flight. We lose our Friday night time on the trip. We have lost confidence in knowing what to expect. Will we receive a message if our return flight is cancelled? Will others receive a message that we do not receive? SW should be more clear when a flight is cancelled and consistent with all passengers. And the app should not show flights that are cancelled. Forgets my itinerary while traveling for work. 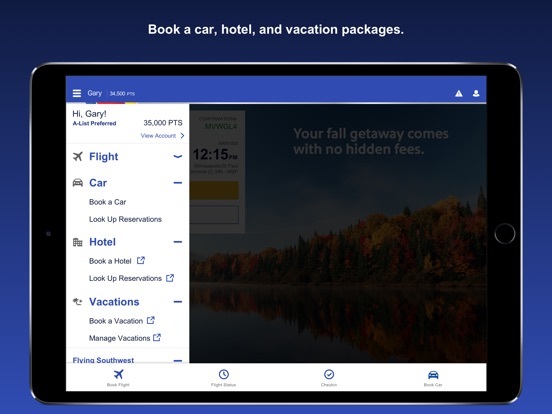 I have trouble using this app when my employer's travel agent books my itineraries on Southwest. This app never receives my information despite the travel agency transferring my frequent flyer account number and me being logged into this app under said account number. I can't fault the airlines as I suspect this is caused on the travel agent side. My complaint about the app is I am able to find the itinerary and check-in but it quickly forgets my itinerary. Sometimes I see the itinerary under past searches, sometimes not, but no updates before traveling or while in route. I rated two stars because app is stable and works decently when I travel on my dimes. P.S. I'm not one to write reviews as I prefer to leave feedback directly to the app developers. It's probably by design but there is no such feature in the app. The link on the app store takes you to a list of phone numbers for various issue none of which have anything to do with the app itself. The three times I flew Southwest in the past 15 months each time the flights were delayed at least 2 hours and the delays were not weather related; they were maintenance problems and crew issues. Direct flights from SAT to DTW are 2 1/2 hours but with Southwest it took close to 8 hours each time and that is not an acceptable and the delay is not worth it the cheaper rate. We have picked Southwest every time for reliability, great rates and friendly professional service. On my last trip the connecting flight in St. Louis was delayed (over 2 hours) while sitting across from my gate I observed the gate personnel sitting behind the desk enjoying a take out meal out of a box and eating it with bare fingers in front of all the passengers. That is a very tacky, unprofessional behavior and a bad reflection of Southwest. Never have I seen such occurrence even in my many overseas travels. Every time I check in exactly 24 hours before not even 2 seconds late I am assigned to board around B30 or above, how is that possible? Additionally, Early bird check in is $15, plus $40 is to upgrade for priority sitting. For $75 more I can fly other airlines with direct flights and will get to my destination a lot sooner than Southwest, plus my luggage flies free as well (1st piece) so I can’t find a reason to keep flying Southwest, and recommending it to friends and family. However, the flight crews on all flights were the only positives I have had with Southwest. I've never had a problem traveling Southwest, and actually prefer this airline. On our way down to Florida we had to change planes in Baltimore. Am traveling with my two grandsons ages 11 and 13. Their Dad is a marine serving in Japan as we speak. The first leg of our trip I asked the Southwest employee at the gate if we were allowed to board early...I have their military IDs, etc. she very graciously told us we could board after Group A....we thanked her! In Baltimore I again asked the employee at the gate the same question and he very rudely and loudly shouted that ONLY MILITARY IN UNIFORM could board early! And "I ALREADY MADE THAT ANNOUNCEMENT!" Well, I'm sorry that I didn't hear his announcement but there is never a time for rudeness especially with all the people there were at the gate waiting to board! It made me feel very embarrassed, my grandsons we're uncomfortable and the people around us were shaking their heads in disbelief. Samuel, I believe his name was, did nothing positive in my eyes in keeping with the usually VERY pleasant and kind treatment from Southwest's employees. Let's see if my trip home will be nicer! Personally I do not care if we are allowed to board early...but if it's a benefit my grandsons are entitled to them I shall seek it for them. They definitely learned a lesson in how not to behave when you're interacting with the public!!! Easy to use and so convenient!!! I love flying with SWA and do so as often as possible! 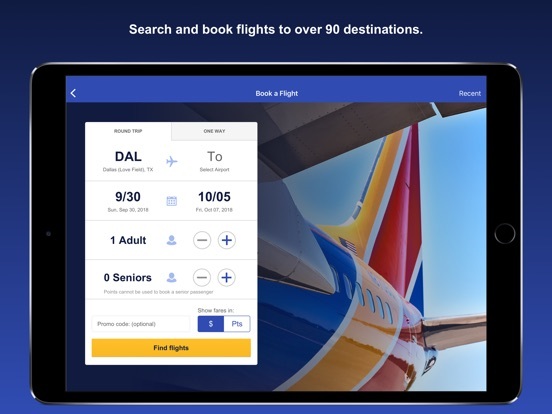 It’s always been easy to book & affordable, with Southwest Airlines, but using this app has made it even easier and foolproof! I love the convenience of having everything in one location when I have a question about an itinerary or pricing, etc.! Not only that, but the added convenience of having the ability to sign in using two-factor verification (via thumbprint or facial recognition), is beyond comparison! Keep up the great work, SWA! PLEASE continue to offer those low fares, & continue offering the inclusion of 2 free checked bags! Your customers truly appreciate it... especially as your competitors continue to increase their rates and try to “nickel and dime” their customers, by charging extra for things such as baggage. Reservations made through other agencies other than Southwest, don’t get atomically linked to you southwest travel rewards account, if you didn’t provide the rewards number initially. I will to be able to look up my reservation in the app and have the app link that external reservation to my rewards number. Also to store it, as previous trips. The reason I say this, is because I made reserved a flight through my employer, I was able to check in in the app, but the reservation was not automatically saved as a previous trip. Nor did I get credit for the miles traveled. I did not provided my travel rewards number when the reservation was done. But I feel that since I was able to check in via the app, that the reservation would should had been saved automatically as one of my previous trips. Weather canceled our flight out on 12/28. Those things happen. SW could not get us a flight out until 12/30 (afternoon). We decided to drive to Phoenix and catch a flight from there. Unfortunately SW would not honor our purchase price from ABQ, so we had to pay an additional $350. Acts of God are not anybody’s fault but I feel SW is taking advantage of the situation. The seats were obviously open so why not honor the price? Also lots of aggravation to get this booked. Online was showing the same price from Phoenix to SFO all day however it took 3 calls to 3 different agents to get the price that matched the online price. The first two agents could not explain why they just kept insisting that they could only change the flight for an additional $500. Finally agent 876 in GA, Teresa, was able to book us for the online price. She deserves a pat on the back for doing her best to provide customer service. So a very frustrating day, most of it unavoidable but not helped by SW bureaucracy and incompetence . Teresa being the only exception. I’m sorry to have to leave a negative review about southwest as for the most part I’ve had good experience with them. Last week our family was finishing a wonderful make a wish trip celebrating our son’s brain cancer victory. Unfortunately Southwest broke our $500 stroller which was from Australia (Phil and Teds) the main frame responsible for steering was broken in half. Sadly Phil and Teds no longer carries this particular stroller and do not have parts for a repair. I’m very thankful to have our son still alive so keeping things in perspective does help. We have 5 kids and have flown domestically and internationally over 20 times with strollers many of which were much cheaper than this one. Until this incident we had not experienced problems regarding damaged strollers. Much of our flights are in Asia due to our mission work so maybe I’m comparing American Airlines with Asia’s which may not be fair but who knows. Lesson learned don’t travel with an expensive stroller without knowing and understanding the airline’s stroller policy clearly. Love this service but wish you would change DOGS! You almost have everything perfect but people having dogs bigger than a 2 year old on a plane is insane. I don’t understand how you care for peanut allergies and could be so heartless to children with autism who have high anxiety and usually high allergies as well and allow dogs the size bigger than a little child board the plane and be first on and sit where ever!!! Sometimes it’s right when you get on, other times though they are throughout the plane!!!! Seems like the last two rows in the back should be dedicated to them, I am a A-List preferred customer and I am starting to look else where as the dog situation is completely out of hand and your airline has allowed it to be way to easy to bring your pet along!!! I have checked in and find that it is impossible to get a boarding pass on my mobile device through the app. Moreover, your instructions for how to get a mobile boarding pass does not make any sense to me. It looks like I have to go to your website, mail a boarding pass to my phone, and load the boarding pass into my phone from the email. I really think you need to take a lesson from other airlines’ mobile apps. I do not have this difficulty with United, Virgin America, or American airlines. Also, these other airlines send you a reminder 24 hours in advance of the flight. Then when I go to my mobile app my information is there I do not have to have a confirmation number to check in or to find my flight. This is my first experience with your airline and I truly hope that my flight goes better than trying to figure out how to download the mobile Boarding pass from either your app or your website. I ❤️ Southwest Airlines - mostly for the Passenger-Friendly Policies like Free Bags & Not Charging for Changes. Those 2 reasons alone make me a loyal to SW. The app is Very Useful, and straightforward as I would expect also. MUCH Better than any other Airline. I do have ONE Gripe though. Having to enter my Credit Card Info to buy InFlight WiFi or Texting in this age of ApplePay is SO Un-SouthWest-Like. ApplePay is all I use for online purchases bc of it’s Convenience & Security! Please Add ApplePay to your methods of accepted payments for In-Flight WiFi & Texting. That would be SOOO Nice & Southwest-like and I would gladly come back and raise my rating to 5 Stars! Also ApplePay to Buy Tickets in the app or on the website. I’d like for ApplePay to at least be an option bc I’m Such a believer in their security technology when purchasing by device (Touch-ID & now Face-ID)! I’m an avid southwest traveler... but this flight could change all that. There was a storm in Denver so all flights were canceled via an automated service that you could stay on the line to talk to a person for a changed flight. I was stuck in Tennessee. I stayed on the line for an hour. They answered and hung up. I called back, left my name and they told me my phone number. I supposedly kept my place in line. (I’ve used this service before and it normally works) They’d call me back within 70 minutes. That was day before yesterday. I never received a call back. I called them back numerous times and was finally able to get through myself and received a much later flight home. When looking at their website I’ve seen different earlier flights that I could have had if I was able to get through. Of course, that didn’t happen. I understand storms happen. This could have been taken care of had they NOT hung up on me in the beginning. I’ll rethink southwest from here on out. The APP does not keep detailed itinerary receipts. As I travel for work, I have to save my itineraries separately in an email folder. This is inconvenient, especially when trying to gather receipts during crunch time, at month end. As all of my other travel APPs store this information, the technology shouldn’t be too difficult to add this feature. The second issue is that personal and work credit card information is stored on the APP. However, when (on one occasion) I changed a flight that was charged to the personal card, the APP charged the change fee to my work card. This caused problems with my employer. The SWA “executive office” was apathetic. A charge made on one credit card should not be automatically switched to another card when changes are made. This may have been a glitch, but it was NOT resolved satisfactorily. I decided to take the plunge and apply for the southwest credit card due to the fact that I plan to be traveling frequently in the next two years. They had a good promotion going that I would be getting 10,000 points and $200 off from my first purchase if it was over $500. It happened to be that my tickets would be just over that qualifying amount so I applied. Here’s where I ran into trouble, it would not allow me to use the card at checkout because I had not been approved yet. So I had to wait over a week to get my card to even use it, by then my tickets were 200$ more and I wound up saving nothing by getting a credit card. When I called to talk with southwest about this they could do nothing for me and I was told to take it up with the credit card company, and likewise the cc company said I needed to talk with southwest about it. All in all it was a frustrating experience, and I received no help from southwest on the matter. Why no mobile boarding pass from mobile app? The instructions for obtaining a mobile boarding pass do NOT work on the website. There is only an option to print. When emailing to self, it just sends the link or a pdf and nothing to add to Apple Wallet. Furthermore, why doesn’t the app have this capability? Major gap in capabilities. I spent several hours trying to figure this out over the course of several days, but it never worked. Delta, who I hate flying with, actually made it exceptionally easy to download a mobile boarding pass. Additionally, although the app lists “gate” under details, it never actually provides a gate number, so this is just blank. Pretty useless capability. It would be much more convenient to have the info on the app like it says it does and avoid having to look for flight monitors in the airports. The app has come a long way from the absolutely pointless direction it has last year, but unfortunately it has a disappointingly long way to go. Is not user friendly. Trying to select FROM city TO city...I had to do it 3-4 times because they’re both on the same line...I was trying to select FROM Rsw TO cmh and it took awhile. Then after selecting the flight, I kept highlighting it and nothing happened.....finally after several tries it accepted the flight. Just wasn’t as easy as it could’ve been. I think this every time I book a flight...that your IT people need to make some changes! Secondly, I had changed another flight (cmh to rsw ) from 4/20 to 4/23 and when I called to check on it, found that my 4/23 flight had not been ticketed! Fortunately your customer representative Roma (who was extremely helpful btw) was able to get me on another flight (at 6am!). I am a frequent flyer and usually do very much enjoy Southwest. So overall I rate you guys as a 4 or 5....on time, crew friendly and many straight through flights....so thank you! SWA used to be our “go to” airline for all travel, but as other airlines started competing for SWA’s monopoly on cheap flights, the benefit(s) of SWA Rapid Rewards has been zapped by “Honey I shrunk the kids”. In the past, when I booked flights for our family, I could do it simply, from my Rapid Rewards login. Each passenger would be listed Sonia could fill in and confirm she, date, gender etc. three seats on the same flight, no problem. Now, you are only eligible for Rapid Rewards for the flights you book if each passenger has a separate Rapid Rewards number. And the only person who can use those reward credits is the person who flew on that flight. That is like requiring a separate Safeway Club Card for every member of your family and dividing your groceries at checkout based on who eats them. And do corporations that fly employees for business travel earn Rapid Rewards that could be used use towards a percentage of the flights they book? NOPE. The money they paid for employee travel is registered separately under each employee name, a separate Rapid Rewards account. If a family of 5 flew to Disneyland, SWA would require 5 different reward accounts. And even though the parents paid for all of the flights, they can’t use the reward points to fly to Colorado in the winter for a romantic anniversary ski trip. It smells greedy to me. I was traveling for the first time on Southwest, recently obtaining a Southwest Rewards member. We were traveling to Ft Lauderdale with some friends for a cruise. They recommended paying the early bird fee to enable us to sit together. We paid the additional $100 for the round trip. From Omaha to St. Louis we had no problem, however from St Louis to Ft Lauderdale we were in the B grouping and were denied seats by 3 different people who were saving seats for someone. We were under the impression this was not allowed. Also it was obvious that they had purchased one early bird seat only to save a seat for their traveling companion. This seems extremely unfair for those of us who paid the early bird fee for both seats. Also, this was a completely full aircraft! If you are going to have these rules you need to enforce them! I've used this app quite a few times to date both for booking flights and for managing my booking/boarding pass. It's worked perfectly every time in a speedy manner. One time recently I even had a situation where I had booked a flight and actually checked in already, when I realised I wouldn't make the flight. I rescheduled to later flight, at no charge (the tickets were the same price, and Southwest don't charge for changes) and switched my boarding pass, all in a few hassle free taps. I really don't see any downsides once you are used to Southwest's seating policy and play ball. The only thing I would like would be for SW's cabin crew to keep their announcements to a minimum as it sometimes feels like they go on forever and can be annoying if you would like some peace.